VISSCHER, N. J. - Comitatus Hollandiae. Comitatus Hollandiae. - VISSCHER, N. J.
Map maker : VISSCHER, N. J.. Size : 18.5 x 22.8 inches. / 47.1 x 58.0 cm. 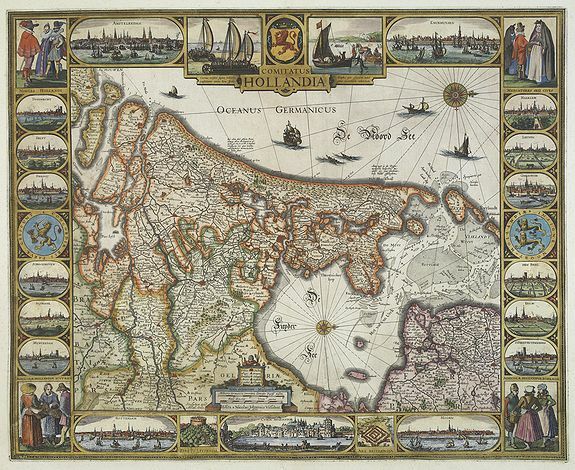 Description :A first edition of one of the most decorative carte à figures maps of Holland. Superbly engraved by Abraham Goos. The map is framed on al sides by decorative borders. The top border shows two town views and scenes with wind-powered wagons on the beach and an ice-sledge. The geographical content still derives from Van Deventer's mapping. The Beemster and Purmer are shown as reclaimed areas. The first state has the date 1630 in the lower part of the scale cartouche. Blonk, mentions only 4 separate copies and one complete atlas containing this map. Condition : Map cut on neat line, remargined for protective reason. The complete lower figured border has been professionally replaced by facsimile.